Hey guys! Today I have another new-to-me brand that I've been sitting on for a while! 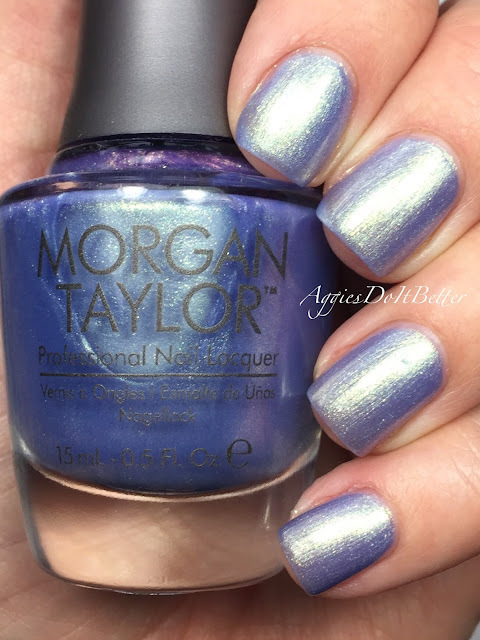 Morgan Taylor came out with a collaboration collection for the live-action Cinderella movie that came out last year. I'm obsessed with all things Cinderella so I knew had to have them! 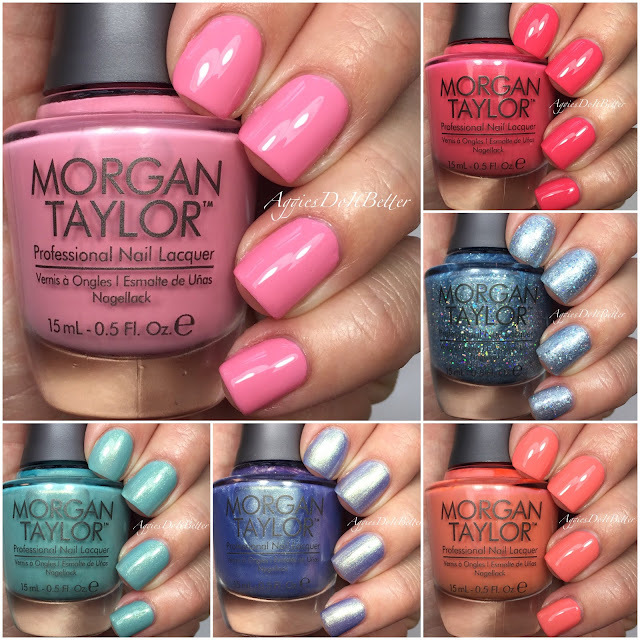 I drug and drug my feet, not knowing much about the brand (I think you can only purchase them online but I'm not sure) and then I wound up winning them in a little contest (a twitter chat called #nailglossip that happens every other Sunday-ish....check it out!) Can you believe that?! I was beside myself. This collection consists of 6 polishes and has a little bit of everything. I checked the website and I'm not sure its available anymore, sorry about that! I'm sure you can find them second hand or around the internet somewhere. I've had them for a while but never wore them. One of my goals this year is to buckle down and get caught up swatching, cataloging, and documenting my polishes. I'm also still destashing like crazy! This is the second in my unofficial new "Brand Review" Series where I'm finally getting through some of the polishes I have from brands I've never used before! Most of these are 3 coaters but I noted how many I used on each swatch. I also used topcoat for all swatches. Best Ball Gown Ever is a sheer shimmer...this is 3 coats but it could use another one. I think this is modeled after Ella's ballgown in the movie. This would look really good matte or over black! It's really pretty but probably not one I would wear a lot. 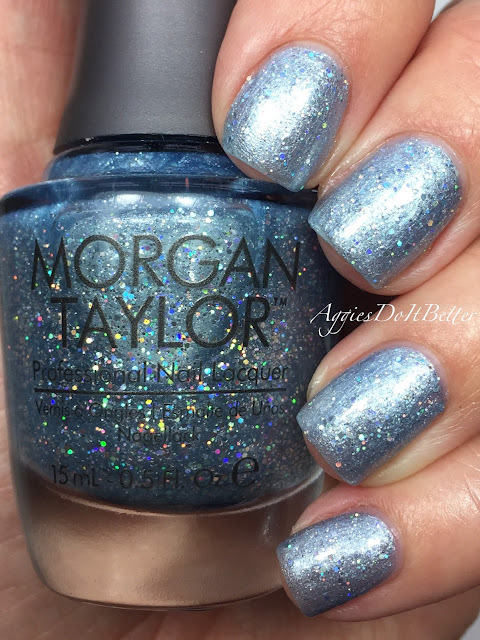 Party at the Palace is a teal crème with a strong silver shimmer. This only took 2 coats, yay! If the Slipper Fits is a silvery shimmery glitter. This is opaque in 2 coats or can be used over another base color as a topper. Watch Your Step, Sister! I a red-toned coral crème. photographs a little more red than it is, its more coral than it shows here. This was again surprisingly 3 coats. It was still streaky after 2. Ella of A Girl is named after the Cinderella character in the movie, who they refer to as Ella. This is a baby pink crème. Not super original, but at least it only needed 2 coats! All in all, I have to say, judging by this collection, I wasn't that impressed with the formulas. I have no other experience with this brand, so maybe it was just me this day. I will definitely be wearing some of these again, and if my experience with them is any different I will update this blog! 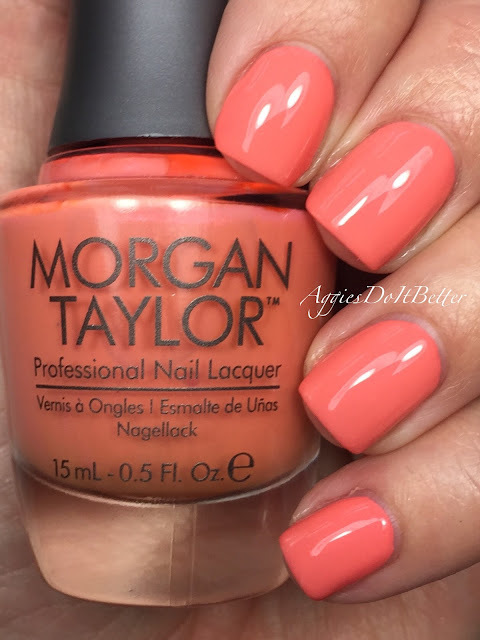 I love MT polishes! I don't see them in real life too often. But I have a handful of them and I love each one. The orange/corals in this collection look lovely. Untried Green OPI spam for St. Patrick's Day!